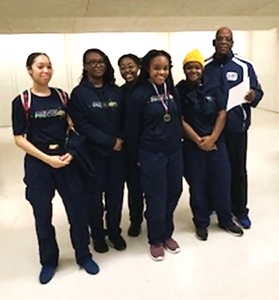 The Southwest DeKalb Panthers riflery team is making an historic first trip to the GHSA riflery state playoffs on Thursday, March 21 against Upson-Lee in Thomaston. Southwest DeKalb finished tied for third in the Area 8 standings with a 7-3 record along with Grady and Carver-Atlanta. The tiebreaker for third went to Grady (1025 score average) with Southwest DeKalb (983.67) grabbing the fourth spot and Carver (980.80) in fifth. Other teams advancing to the state playoffs from Area 8 are No. 1 North Atlanta (10-0), No. 2 Jackson-Atlanta (9-1) and No. 6 Mays (5-5). Coached by James Ferguson the Panthers team’s primary shooters are all girls including three seniors, two sophomores and one freshman. Senior Ayianna Banks is the top shooter for Southwest. Seniors Darielicia Finley and Genesis Alexsis are two more anchors for the team. The rest of the competitors include sophomores Tierica Jefferson and Erica Jefferson and freshman Amani Singleton. Banks ranks in the Top 10 of Area 8 in high composite score with a mark of 277 at No. 9. Tierica Jefferson and Alexsis both have highs of 256 while Erica Jefferson and Singleton have high marks of 252. Banks is also in the Top 10 in two shooting positions including 10th in prone (98/100) and third in kneeling (98/100). Singleton cracked the Top 10 in kneeling with a 95/100 to rank 10th. Banks is also ranked 9th in the Area 8 average score standings with a score of 262.40. That average includes a prone average of 95.40/100 good for 8th. She is also 8th in the kneeling position with an 89.70/100 average. Some of the best performances by the team came against other playoff teams from the Area. The team broke 1,000 for the first time with a score of 1007 against Area 8 leader North Atlanta (1102). The Panthers followed up that with four more consecutive scores over 1,000 in wins against Westlake (1019-964), Mays (1023-1017) and Tri-Cities (1017-885) and a tight 1009-1002 loss to Carver. Upson-Lee comes into the playoffs at 9-1 and as the No. 3 seed out of Area 1 behind Columbus and Northside-Columbus. Upson-Lee finished second to Northside (10-0) during the regular season, but Columbus pulled out a first place finish in the Area Shoot-off.